A human neer (click on image for description). 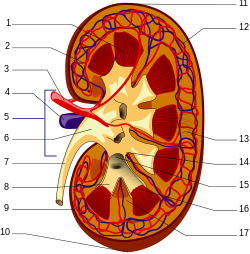 Nephrology (frae Greek νεφρός nephros "neer", combined wi the suffix -logy, "the study o") is a specialty o medicine an pediatrics that concerns itsel wi the study o normal neer function, neer problems, the treatment o kidney problems an renal replacement therapy (dialysis an neer transplantation). This page wis last eeditit on 9 Apryle 2016, at 21:04.